What Is Curry Powder and Does All Indian Food Contain It? If you are new to Indian cooking, you may see the word curry popping up in recipes. What is curry powder or curry? Is it a must-have for every Indian meal? What Is Curry Powder and What Is Curry? A curry is a type of Indian meal, and curry powder is a key ingredient in many—but not all— Indian meals. This is a misconception, though, as all Indian food does not contain curry powder. A curry is an Indian dish that contains meat and vegetables and served over rice. Typically, it includes an Indian-style sauce made with strong spices such as turmeric. There are many varieties of curry meals or curries. The spice blends used in a curry often vary according to religious beliefs, cultural norms or geographical regions. Spices can be ground or used whole, or they can be cooked or added raw during different times in the cooking process. The meat in a curry can be shellfish, poultry, fish, or meat. The curry can be vegetarian, too, meaning that no meat is included. It is up to you what types of ingredients you use...curries can vary wildly and as you see fit. Curry powder is a mix of spices collectively known as garam masala. It is added to some dishes along with other spices to enhance their flavor and aroma. While the basic ingredients used are the same, each household has its own proportions so that the end result will often differ from home to home. The better the quality of the ingredients, the tastier the garam masala and the resulting dish in which it is used. 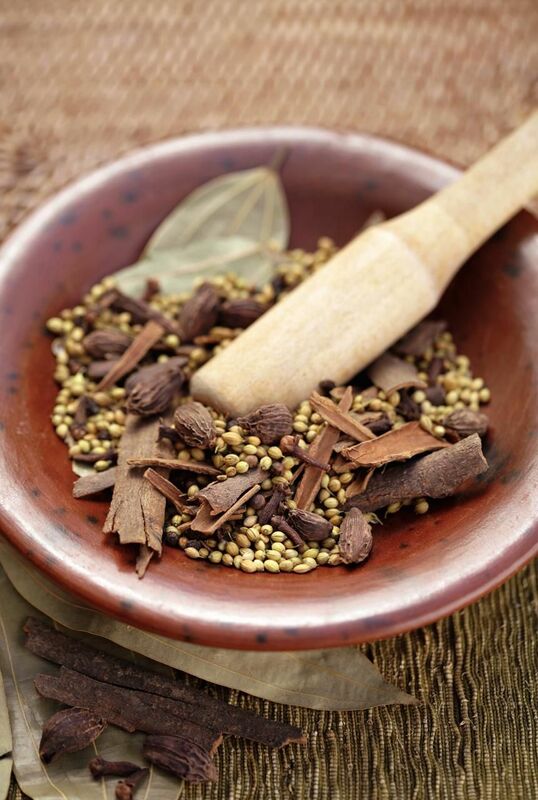 Most Indians still prefer to prepare their own garam masala just prior to cooking. Making your own can seem intimidating if you’re just starting out with Indian cooking, but this recipe for garam masala and a good coffee grinder are all it takes to make your own curry powder. The blend of spices typically incorporates coriander, cumin, turmeric, chili peppers, and fenugreek. Other spices that can be incorporated into a curry powder include everything from ginger, cinnamon, garlic, and clove to mustard seed, black pepper, and fennel seed. There’s nothing to beat the flavor of freshly made curry powder or garam masala. Try to make your own varieties of curry powder blends. There are plenty of combinations that can make a great curry powder and, therefore, a great curry, too! If you are just starting out experimenting with Indian cooking, try making a basic curry, and then modifying it by adding or taking away spices in the next batch. The tastes can completely vary depending on adding or taking away certain spices, giving you a wide range of tastes to enjoy.